Sorry I haven’t posted for a couple of days, after we went back to school shopping for the kids, I figured I could probably use some new pants as well… what do you think? 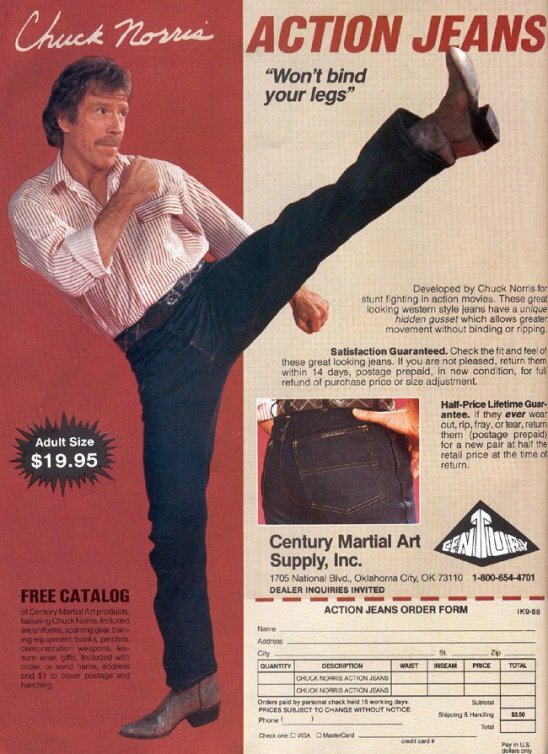 Yea, that’s what I thought – you go ahead and keep your comments to yourself before I roundhouse kick you in the larynx… cause with these jeans – I can do it. 2. Chuck Norris counted to infinity – twice. 3. Chuck Norris does not hunt because the word hunting infers the probability of failure. Chuck Norris goes killing. 4. If you can see Chuck Norris, he can see you. If you can’t see Chuck Norris you may be only seconds away from death. 5. Chuck Norris sold his soul to the devil for his rugged good looks and unparalleled martial arts ability. Shortly after the transaction was finalized, Chuck roundhouse kicked the devil in the face and took his soul back. The devil, who appreciates irony, couldn’t stay mad and admitted he should have seen it coming. They now play poker every second Wednesday of the month. 6. When the Boogeyman goes to sleep every night he checks his closet for Chuck Norris. 7. Chuck Norris built a time machine and went back in time to stop the JFK assassination. As Oswald shot, Chuck Norris met all three bullets with his beard, deflecting them. JFK’s head exploded out of sheer amazement. 8. Chuck Norris has already been to Mars; that’s why there are no signs of life there. 9. In fine print on the last page of the Guinness Book of World Records it notes that all world records are held by Chuck Norris, and those listed in the book are simply the closest anyone else has ever gotten. 10. A blind man once stepped on Chuck Norris’ shoe. Chuck replied, “Don’t you know who I am? I’m Chuck Norris!” The mere mention of his name cured this man blindness. Sadly the first, last, and only thing this man ever saw, was a fatal roundhouse delivered by Chuck Norris.